Master color expert. Elite hair stylist. International Entrepreneur. The creative inspiration behind our salon. Meet our passionate and inspiring leader, Beli Andaluz. Recognized by media outlets through the area as one of Las Vegas’s top hair stylists, Beli has more than 15 years of hair styling experience. 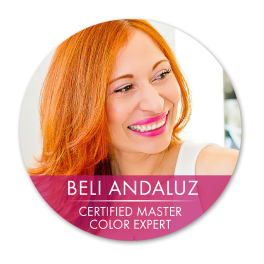 She is one of only 266 certified Master Color Experts in the U.S and is a Sassoon-trained cutting and styling specialist. But what draws people to Beli is not her credentials. It’s her passionate, creative vision for creating the perfect look for you. Whether it’s color, cuts, extensions or texturing, Beli’s hair creations are inspired, beautiful and one of a kind. Call (702) 212-0544 for a personal consultation with Beli. Anarely is living her dream. She always wanted to be a hair stylist, and has worked in salons since she was 16. After developing her skills in Santa Monica and Marina Del Ray, Ana came to Las Vegas and landed her dream job at Beli’s hair salon in Summerlin. With personal mentoring from Beli, Anarely has developed into one of our top stylists and comes highly recommended by our clientele. Anarely focuses on young professionals, students and the young-at-heart; her talent shines in edgy, fashionable cuts, styles and colors, for women and men alike. Call (702) 212-0544 for a personal consultation with Anarely.